Detailed course resources available at MIT Open Courseware. I co-led a workshop about designing, building, and prototyping electronics devices and experiences during MIT’s IAP with Kyle Keane, Mark Vrablic and Abhinav Gandhi. No previous experience with programming or electronics was required. Topics covered included micro-controller programming using Arduino, collaborative software development using GitHub, solder-less electronics prototyping, electronic sensors, rapid prototyping, and small team management. Sponsored by MIT-SUTD Collaboration, Materials Science and Engineering and Craig Carter, Professor, Materials Science and Engineering. 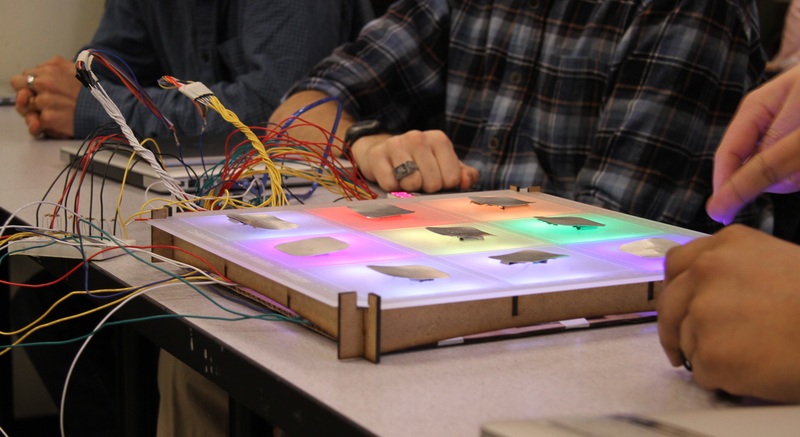 9-day hands-on workshop about collaboration, design, and electronics prototyping. No previous experience with computer programming or electronics is required. Beginning students will be taught everything they need to know and advanced students will be challenged to learn new skills. Participants will work in small teams to design and build electronics projects using open-source microprocessors. Team projects are completely open-ended and designed by participants, past projects have included: an internet-connected weather simulation station, a giant LED billboard, and a CNC drawing machine. Participants will complete three guided projects in order to learn the fundamentals and will then break into small teams to complete a one-day mini-project of their choosing. After the mini-project, participants will break into new teams that will each get $250 and four days to design, plan, and build a custom project of their choice. On the last day of the course, students will present their projects in public exhibition and have the chance to win a prize for crowd favorite. Participants will learn about microcontroller programming using Arduino, collaborative software development using GitHub, solderless electronics prototyping, electronic sensors, rapid prototyping, and small team management.